Oh good. An episode about bullies. Storytime. Once upon a time, I was bullied pretty badly. A group of kids in my elementary school decided that I made a great target and harassed me relentlessly. It was so bad, my mother actually pulled me out of that school and moved sixty miles away. There, of course, I found a new set of bullies. Turns out, you can’t run away from problems like that. Babs has a similar problem. She’s been bullied so bad that she’s been sent out to her cousin’s farm for a week to recover. There, of course, she runs into Silver Spoon and Diamond Tiara, two truly terrible bullies. In the course of meeting them, she has an opportunity: She could join her new friends and continue being bullied, or she could join the bullies and avoid their torment for now. They’ll turn on her eventually, of course, and when that happens she’ll probably start bullying the bullies a la Mean Girls. For the moment, though, she’s safe. And as long as she continues bullying her cousin and feeding her fellow bullies treats and hideouts, they’ll leave her be. Eventually, with a little bit of love and friendship from the Crusaders, she learns how to stand up for herself without becoming a bully. Assertiveness without aggression. It’s a hard lesson, one that Fluttershy has also had to learn the hard way, but one that is so very important in the grand scheme of things. I absolutely love the A-Team references. I’m sure I’m not catching all of them, but once the music tipped me off I started picking them up. Pretty sure that means that Apple Bloom is Hannibal, Sweetie Belle is Faceman, Scootaloo is Murdock, and Babs Seed is B.A. Drawing connections between points when no such connections actually exist #5144: Applebloom must be secretly shirking her duties on the farm to take lessons from Rarity and/or Rarity is sneaking into Applebloom’s room in the middle of the night and feeding her subliminal thoughts while she’s sleeping, because when do we ever see Applebloom care much about what she’s wearing? 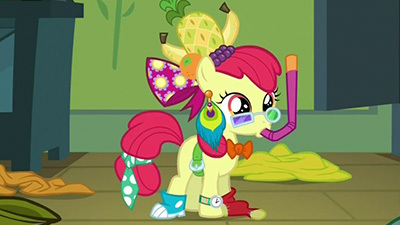 I mean, this is Applebloom the Uncouth we’re talking about, after all! Either that, or she’s taking lessons from Pinkie Pie. Given the awkwardly abrupt introduction of Shining Armor not too long ago, I went into this episode with a bit of hesitance when it first aired three years ago this month. Whereas Twily and Shiny were supposedly super-close pals, though, Applebloom and Babs are very much not: in fact, that the two have never met before makes the whole abrupt introduction to a new character much less awkward. And whereas I tend to be leery of new character introductions just for the sake of introducing new characters, Babs’s introduction serves a very targeted purpose: to show one way by which bullies can be born, and to show one way by which bullies can die and be reborn as a friend. To that extent, Babs serves a greater purpose than just an instrument by which the plot is advanced than, say, Shining Armor, who for all his good looks really was just a vehicle to bring Chrysalis and Cadance into play. Not to pick on the guy and not to suggest I would rather have a bully cousin than a dependable big brother (best friend forever portion optional), of course, but when it comes to learning something about friendship, I think Babs performs much better than Shiny… and by being a total jerkface, no less! Well, not a total jerkface, I guess. I admit I never really cared a whole lot for Babs as a character, but after having had a few years to reflect on her and then watching the episode again, I’m drawn to her a bit more. She has a glaringly obvious “tell” that broadcasts her insecurity and self-consciousness about her lack of a cutie mark (and all the bullying that has ostensibly caused) in no uncertain terms, and that insecurity clearly drives her to take any measure necessary to divert attention away from her… even if that measure is to become a jerkface and join ranks with Diamond Tiara and Silver Spoon. What at first can come off as shallow and juvenile behavior turns out to be much deeper and more complex (if still juvenile), as it’s really a desperate attempt to assert some sort of control over circumstances she has heretofore had no control over whatsoever. While that doesn’t excuse her meanness and demolishing the CMCs’ pumpkin float, it does distinguish her from somepony who is just downright cruel… even if that distinction is not immediately obvious. …and oh how quickly my mind changed. 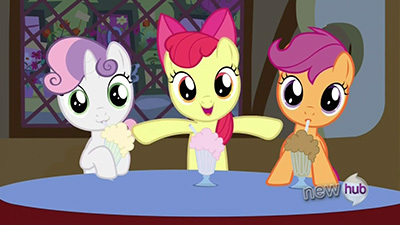 I think the only way this could possibly be more adorable would be to add Fluttershy into the mix. And lo, the Internet delivered, and there was much rejoicing and heart-fluttering. Anyway, I guess what I’m trying to say is I enjoyed this song a lot, especially after coming back to it. My favorite songs in the series are those that follow a verse/refrain pattern (Winter Wrap Up, Art of the Dress, Smile Song) as opposed to just musical dialogue (Find a Pet), and Bad Seed nails that extremely well. The visuals going on are top-notch as well and run the gamut of believable to absurd, something we haven’t seen very often but something I certainly would enjoy seeing more of in the future. 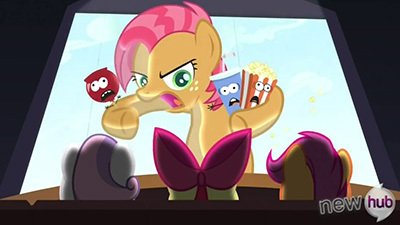 And while we’re on the topic of the song: did you notice Berry Punch in the movie theater? 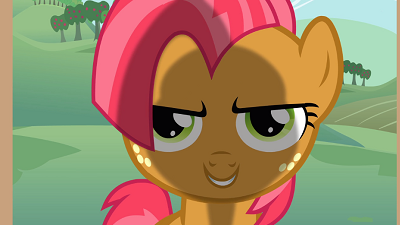 Also, going back to what I was saying at the beginning of my post, Babs must also be taking lessons from Pinkie Pie. I mean, who else could teach her the art of popping out of the screen? Funny how the threat of being called a snitch trumps the sensibility of consulting with the adults, even when that means you wind up losing your clubhouse and sleeping on the floor in your own dang room. I guess it’s just that childhood mentality though, whereby completely arbitrary rules dictate your actions more powerfully than common sense: for me it was having to shout “Safety!” immediately after passing gas lest someone say “Doorknob!” first and be granted an irrevocable right to punch me repeatedly until I managed to touch a doorknob, for Applebloom and the CMCs it was staying quiet lest they be labeled a snitch for the rest of their lives. I was bullied throughout elementary, middle, and high school (which I’m sure nearly everyone reading this blog can relate to at least partially, as with the rest of this episode in general), and much of the time I also tried to keep things bottled up or just between my friends, much like the CMCs did. But, not surprisingly (at least now with 20/20 hindsight anyway), when I did get parents and school administrators involved, the situations seemed to get a lot better a lot faster. They never entirely went away, but they did serve to make the bullies see the consequences of their actions, and that was often enough to get them to think twice about what they were actually doing. Gathering the courage to actually say something did take time, though, and I certainly wish that back when I was in school there had been as many anti-bullying programs as there are today that could have helped to provide support. In the end, though, bullying is such a complex problem that has no easy answer, other than the obvious “don’t be a bully in the first place.” As long as nobody is a bully then everyone wins, but the moment somebody goes to the dark side then everyone loses and is dragged into an intractable quagmire. Harmony seems to be an unstable equilibrium, and that can be disheartening. I guess Sweetie Belle put it right: “WHY DOES LIFE HAVE TO BE SO IRONIC! ?” (or be in the water, for that matter). Which is basically a very long-winded and rambling way of saying: what a great topic to cover with the aid of cute pastel ponies that you don’t want to see hurt or humiliated… unless they’re pink or grey and have names like Diamond Tiara or Silver Spoon. Oops, sorry, that one kinda slipped out. Back to the silly: Rarity’s emergency edible boots. Those came out of nowhere, and never come up again. Wasted potential, or truly irrelevant? Oh, and this happened too. Definitely a clip straight from the episode, no editing whatsoever. So anyway, initially kind of a cringe-y episode for me, but ultimately a pretty solid one in my books. The obvious choice for a song here is a remix of Babs Seed, but they all tend to kind of sound the same. So I’ll try to get a quirky one of the bunch, Babs Seed (Remix) by The Living Tombstone, who does a pretty good job of capturing the unsavory flavor of a bully in musical form while keeping the track listenable. A rather strange combination if I ever heard one, but he pulls it off pretty well! It’s always a bit iffy when MLP tries to touch on more “difficult” topics. It can be done well, and you get a Ponyville Confidential, or a (several seasons from now, we’ll get there eventually) Tanks for the Memories, where a somewhat complex and heavy concept that can have direct real-life parallels is delivered clearly and effectively. On the other end of the spectrum, however, sits episodes like Bridal Gossip, where the message is so clumsily delivered and botched in the process, and you’re left wondering whether it would have been better for them just not to attempt to go there in general. This is an episode directly about bullying, from the perspective of children (which we’ve dealt with before but never focused exclusively on), and with how much of a serious topic that can be, I get the feeling that the writers were very careful in their approach. The episode manages to maintain the series’ normal comedic and whimsical tone while simultaneously not trivializing the subject matter and taking it seriously, and that in itself is an accomplishment. It does result in something that doesn’t really dig terribly deep, but for what it’s worth, I think it’s a relatively decent look at one particular kind of bullying, where it can come from, and how best to handle it. I like both through Sweetie Belle’s urgings (actually putting her on the reasonable side for once) as well as Applejack’s statements by the end that the message is largely “talk with an adult about this”. If there’s anything that I wish they’d maybe touched on a little more, it’s that the kind of bullying that Babs typifies is not representative of all kinds of bullying across the spectrum (especially when it comes to girls). They certainly never make the claim that it is, and we’ve dealt with other kinds of bullies in other episodes (Diamond Tiara and Silver Spoon are the obvious examples, and once we eventually finally do get context for why they’re the way they are, it’s not quite the same reasons behind Babs’ actions). But without saying anything about it, it does run the risk of sending the blanket message of “this is why bullies are the way they are”, and that’s not universally true. That said, in the context of the specific type and cause of bullying that the episode runs with via Babs, I think it’s handled relatively well. This was a topic that could have resulted in another bungled message, and they thankfully manage to avoid doing that. 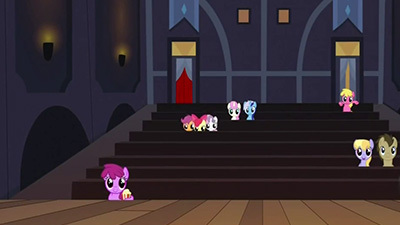 The end result is something that isn’t particularly noteworthy in one direction or the other, and aside from the song (which I absolutely adore), this episode isn’t one that stands out super strongly for me, either among the CMC episodes or the show as a whole. I went to bed last night thinking I would have a lot more to say about this episode than I ultimately do. Yes, I have a history of having both been bullied and being a bully. I know what it’s like to have so many things turn against you in your life that you start funneling suffering on down to others out of some grasping attempt to achieve power and control. I know what it’s like to turn on people who care about you and who you care about because you keep wanting to feed into this image you’ve created for yourself because you’re hinging so much of your sense of control on your reputation that you’ve cornered yourself into feeling like you have no choice but to continue bullying. The main reason I don’t have much to say is this episode just doesn’t really get into it all that much. Yeah, we know Babs’ anger comes from her own bullying that she suffered in her hometown, but we never hear about what actually happened aside from it being aimed at her blank flank, and when she says in the end that she feels she can now turn to her sister for help, it’s the first we’ve ever heard of this sister and we had no exploration of how alienated Babs felt with regards to reaching out. By putting so much of that angle on the CMC’s, and their endless quest to not be snitches, it ends up drawing out their side of things to an overly significant degree. Instead of really rooting down into it, like we have in the past with the insecurities of Pinkie Pie and Twilight, the episode is largely, oddly, a gag episode as Babs keeps throwing things at them in exaggerated ways, there’s a big musical number montage, and then a big silly chase involving Pinkie Pie and lettuce puns. The episode throws a lot at us, but never lets things settle long enough to actually process deeper meanings before just throwing stuff at us again. By shortening the CMC’s attempt at payback, they could have given Babs some more focus in the back end to actually open up about things and get into it in a way which had more resonance than it does. 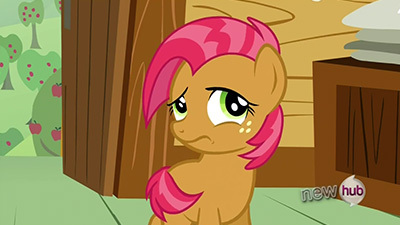 The CMCs apologize, she apologizes, but there’s never any further exchange beyond that, anything that puts the CMC’s clashing view of blank flanks with hers in a broader context. 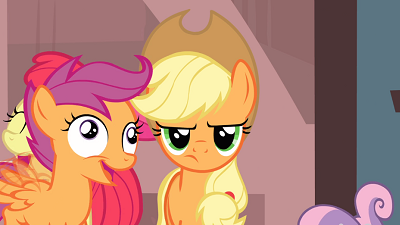 And Applejack’s line about how “Y’all coulda just come to me” feels more like a punchline than an actual message to kids that it’s okay to ask for help when being bullied. 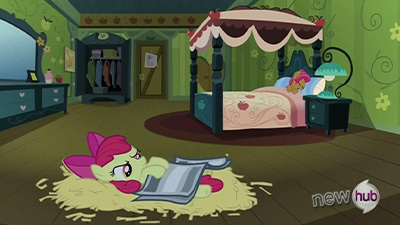 I don’t know, I just don’t click with what they’re trying to do here, and I feel we’ve already covered much of what this episode is exploring in both “Griffon the Brush-Off” (also written by Morrow) and “Ponyville Confidential”. On top of not really exploring its themes to a significant depth, this leaves the episode feeling redundant, with nothing really new to add that we haven’t already seen. Ok, yes, the lettuce bit was new and gloriously Pinkie, but still. And I don’t want this to come off as saying “hey, give the bully a chance to speak so we can sympathize with their POV”, because there’s a lot that bullies do which can’t and shouldn’t always be forgiven, even when their side is understood. My prime bullying days stopped because I moved, which allowed me to refocus on who I was coming off as versus who I really wanted to be, as a new environment gave me a chance to reinvent myself. But that also means that I never apologized to those victims I left behind and that I’ll always be remembered by them for being that monster who humiliated them. That’s another coda to the ending that I feel this episode lacked, that even amidst the forgiveness, there’s probably still some genuine hurt that which left some wounds which can’t just be healed right away. Ultimately, it’s still a fine episode. I do like the musical number, as well as the clubhouse tour, the initiation ceremony, the sadly false wrench Cutie Mark, the role Tiara and Spoon play in things, the pig. Still, I do wish it had gone much further into what it was trying to explore because what we ended up with is largely just a gag episode that comes and goes without much significant resonance. Which is a shame, because this is a topic that should resonate, that should have some deeper level of impact than it does here. I wonder if they were worried about it coming off too hard and triggering given the target audience and felt they needed to soften the blows. I get that, but only to a degree. If you’re willing to explore Pinkie to the point of portraying a full on psychotic break, I think you can go a little further here than you did.